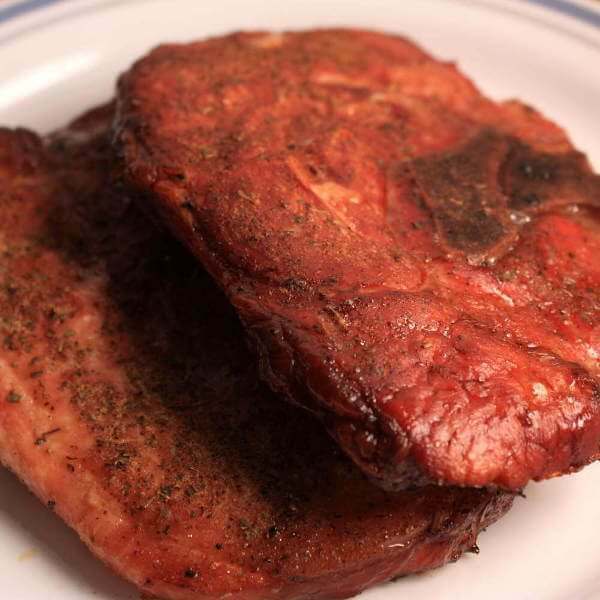 Succulent smoked pork chops are a big winner at any cookout. They don't take a long time to cook, especially if you choose the thinner chops. For flavor, use a dry rub, or they can simply be seasoned with salt and pepper before smoking. But for better taste and texture, the pork chops can be brined before smoking. By modifying the protein structure of the meat, brining minimizes the shrinkage that squeezes out the flavorful juices. A mixture of three-quarters of a cup salt to one gallon of combined water and juice is used for this recipe. 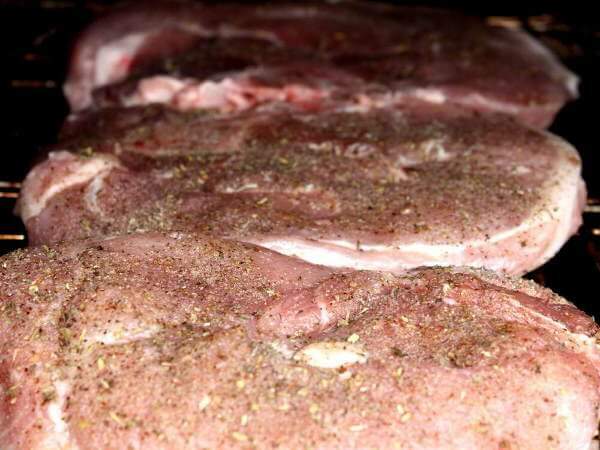 One gallon of brine is enough for three to four pounds of pork chops. Herbs, spices and other fruit juice or beverages can be substituted if you'd like to experiment with different flaors. Here's one of my brine recipes that I used with these half-inch thick chops. Combine one-half gallon of water with one-half gallon of apple juice or cider. Add three-quarters of a cup of canning salt, one tablespoon of cracked black peppercorns, one teaspoon of crushed garlic, and one small onion, sliced thinly. Brine the chops in the refrigerator for one hour before smoking. The apple juice adds some sweetness to the smoky chops... pork and apple is traditional combination that works well. After brining, a simple dry rub made with black pepper and dried Italian herbs was added- an optional step that will add another layer of flavor. 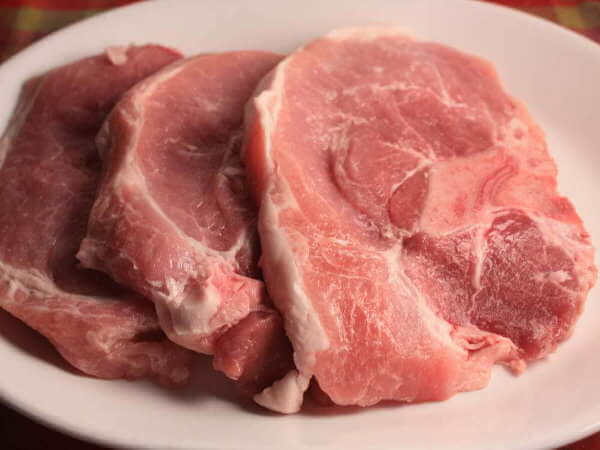 Pork chops are safely done when cooked to medium, a temperature of 145 degrees Fahrenheit. At this temperature, the pork will be slightly pink. Pork no longer has to be cooked to well-done in order to make it safe. Learn more about pork safety at this USDA page, Pork, Farm to Table. 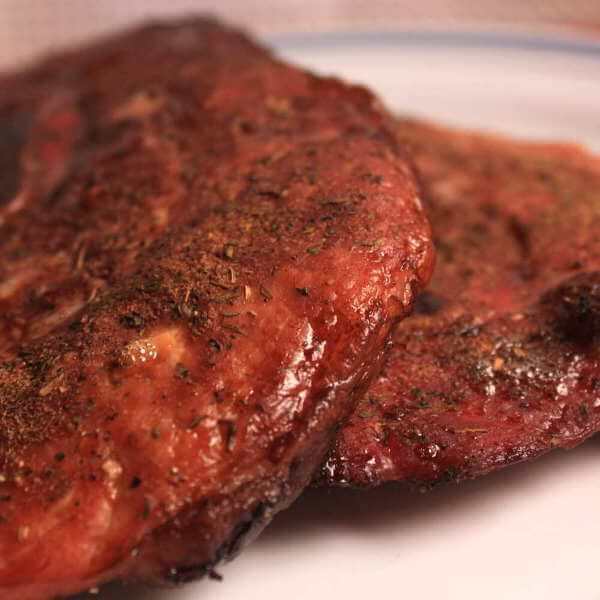 A smoker temperature of 225 to 250 degrees Fahrenheit is ideal for smoking the loin chops. Depending on the thickness of the meat and smoker temperature, the chops will take from two to four hours to smoke. My preference of smoking wood leans toward fruit woods, like apple or pear, or hickory. Mesquite and oak can overpower the flavor unless used in very small amounts. A traditional barbecue calls for a heap of smoky beans alongside the smoked pork chops, at least in my neck of the woods. Other options that compliment the taste of the chops well would be a variety of grilled veggies that can be cooked on your gas or charcoal grill as the pork chops are finishing up in the smoker.